1. The URGENCY of responding to the issue of climate change. 2. Passive House presents a beautiful and artful way to respond positively to this challenge in our industry. With our team presenting on Solis, and the keynote from Carly Coulson discussing her amazing student housing in Duluth, Minnesota, it is clear that Passive House is scaling up, and mid-rise and high-rise multi-family designers need to incorporate these tools into their design toolbox! 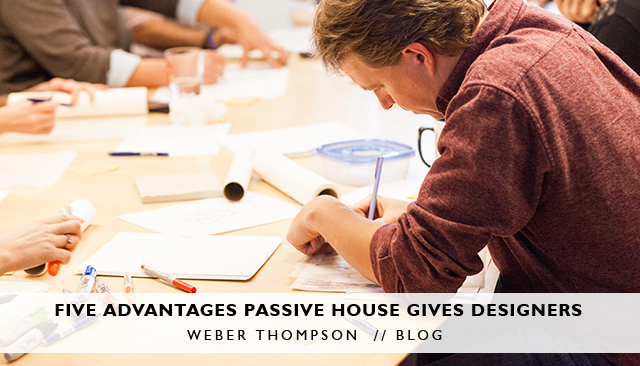 The following list is a few “designer considerations” to leverage Passive House best practices into the aesthetic design of your project, while balancing the usual budget constraints. 1. Quality Design. A certified passive house will be energy-efficient, have fantastic indoor air-quality and acoustics, while also providing a high level of durability and resiliency. A budget conscious client with Passive House goals should understand that this level of quality comes with a cost and will require high-quality products, and systems to achieve these goals. 2. Focused design effort. A Passive House wants to be as simple and “neat” as possible. While complex conditions may present themselves during the construction process, working together to minimize these situations will aid in the success of the entire project team. By challenging our designers to keep things simple, it means every massing move needs to be justifiably strong, improving the intent, meaning, and value to the project. 3. New Tools in your “kit of parts”. If it doesn’t need to go inside, put it on the outside! Downspouts, exterior stairs, elevators, even structural elements can be externalized to the benefit of a passive house, but keep in mind your focused design effort from Advantage #2. These elements can provide added depth and interest to make up for a designer’s concern for the over-simplified massing. 4. Rigorous coordination and a holistic understanding of ALL aspects of the building. Multi-family residential buildings are perhaps the most complex to design, coordinate, and construct. In passive house design, the mechanical system plays a major part in the success of the project, requiring this building component be considered well in advance of the standard Design-Build preference the market currently supports. With the mechanical system comes electrical and plumbing coordination, all with potential to balance cost increases required by other systems in the building. 5. The Sense of accomplishment and pride that comes from designing a building that goes above and beyond the current status quo.The global climate is in flux, and we have no idea where it is going to take us—none of our historical data can provide a precedent for this level of change. We do know how to prevent it from changing further, though—carbon sequestration, most effectively achieved by drastically reducing our reliance and use of carbon-fuels to generate energy. A Passive House building does just that (and a number of other great things, as well!). Feel proud of what you’ve accomplished and optimistic about the future of the profession! Aaron Swain AIA, CPHC, NCARB, LEED Green Assoc.